Why Isn't This Real? I Wish This Was Real. Patrick found this picture in some Facebook feed, and, of course, my attention was grabbed, just like this picture had grabbed my attention’s hypothetical attento-nuts. A New Beetle, with a proper vintage Beetle drivetrain? What a great, non-trivial swap! It makes a statement, is technically interesting — too bad it’s not real. I mean, at first glance, it looks plausible, until you really start thinking about what’s under the skin. Those exhausts are pretty far away from where the exhaust ports would be, but a custom, huge header could justify that. The real issue is that the engine is just too high. The lower pulley there is the crankshaft, and the opposite end of that would be centerline with the transaxle. And that would put the half-shafts way too high (and forward?) to actually drive the wheels where they are. So I’m sad to call fake on this one. Still, this seems like a fantastic concept, though. I think the way to approach it would be to not use a VW pan, as you’d think — it’s about 4 or so inches too short in the wheelbase, and the unit-body new Beetle would be difficult to mount well on it. 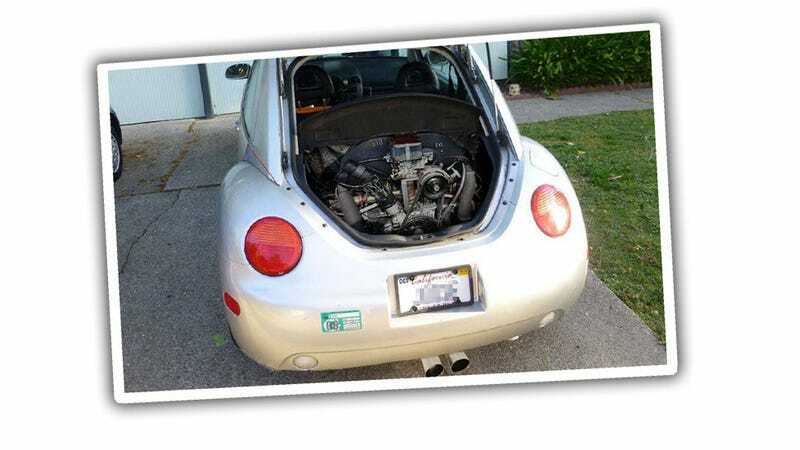 I think I’d consider taking just the engine, transaxle, and possibly frame fork from the original Beetle and implanting them (lower) in the New Beetle’s body/frame. This would be tricky, but I think achievable. Plus, you could make a twin-engined Beetle like the 2CV Sahara, if you wanted to make your back seat into a gas tank, too! Still, I am a bit disspointed this is just a Photoshop. Oh well.